Posted in: ATP, Houston, Jeff McMillan, On Site. 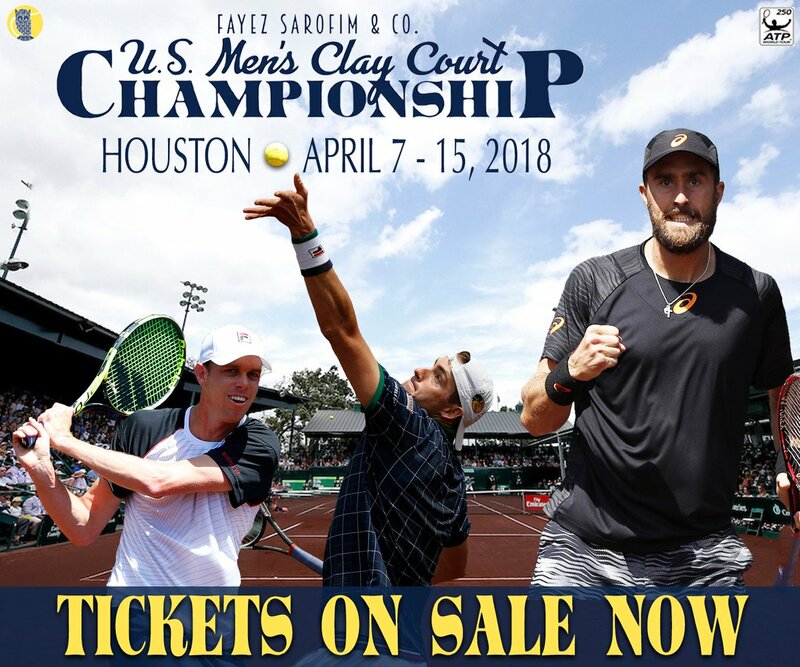 Tagged: 2015 ATP Houston, 2015 US Mens Clay Court, 2015 US Mens Clay Court Championships, atp, ATP Houston, fernando verdasco, Houston Tennis, Hyeon Chung, Jack Sock, Janko Tipsarevic, John Isner, Roberto Bautista Agut, Santiago Giraldo, tennis, Teymuraz Gabashvili, US Mens Clay Court, US Mens Clay Court Championships. 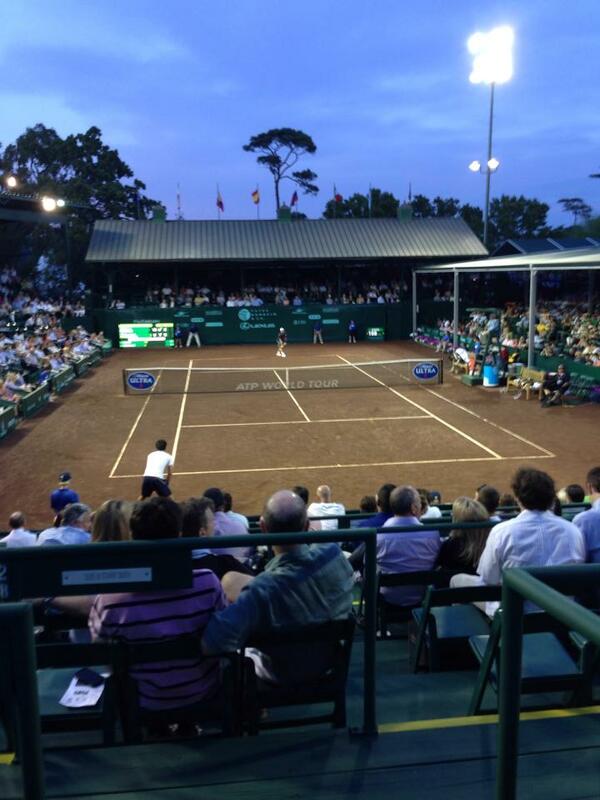 Another warm day in Houston at the US Men’s Clay Court Championships began with an intriguing matchup between Jack Sock and the #2 seed Roberto Bautista-Agut. Sock had won the previous meeting between these two players just a few weeks ago in Indian Wells and he was looking to make it two straight vs the top 15 player but this time it would have to be on the Spaniard’s favorite surface. His quest to do just that began positively with a break in the 3rd game of the match to go up 2-1. Sock kept his advantage all through the 1st set despite Bautista-Agut’s chances. The Spaniard was able to get into Sock’s service games, often getting to 0-30, 15-30, deuce and even had a few break points here and there but was unable to ever even the match. RBA seemed to be a tad timid on his footwork and was arriving to balls late, causing them to go into the net or go long. Killing his usual strength of consistency. Sock on the other hand was hitting his forehand hard and reliably which contributed to RBA’s lateness of getting to the shots. Sock served out the first set in style with some big serves and a rocket forehand winner to take it 6-4. At the start of the 2nd set Sock hit a rough patch. He double faulted a couple times (9 times in total in the match, he would later say that the wind was an issue all match long) and had a very easy putaway forehand go into the net. Despite these hiccups he did not concede serve and that ended up being the key to the match, holding despite not serving or playing his very best at the beginning of the 2nd set. At 2-2 in the 2nd set there was a slight controversy with a ball mark and Bautista-Agut said something across the net to Sock and Sock said something back. Right after that Sock served two huge service winners and let out a loud bellow of “Yeah! Come on!” after each serve right at the direction of Bautista-Agut. This seemed to amp up Sock even more as he quickly got to 3 break points in the very next game on RBA’s serve. He did not convert on any of the 3 but at deuce RBA made a lazy backhand error and threw in a double fault on the 4th break point to give Sock a break, which he would not relinquish. Determined to punch his way to the quarterfinals. Sock held serve the rest of the match with very little drama until 30-30 5-4 with Sock serving for the match. On that crucial point Sock hit a risky forehand chip and charged the net, the chip barely clipped the line on the sideline and he was able to finish the point off at the net. One more millimeter to the left and Sock would have faced a break point right there, but instead he had a match point, which he converted with a good kick serve. 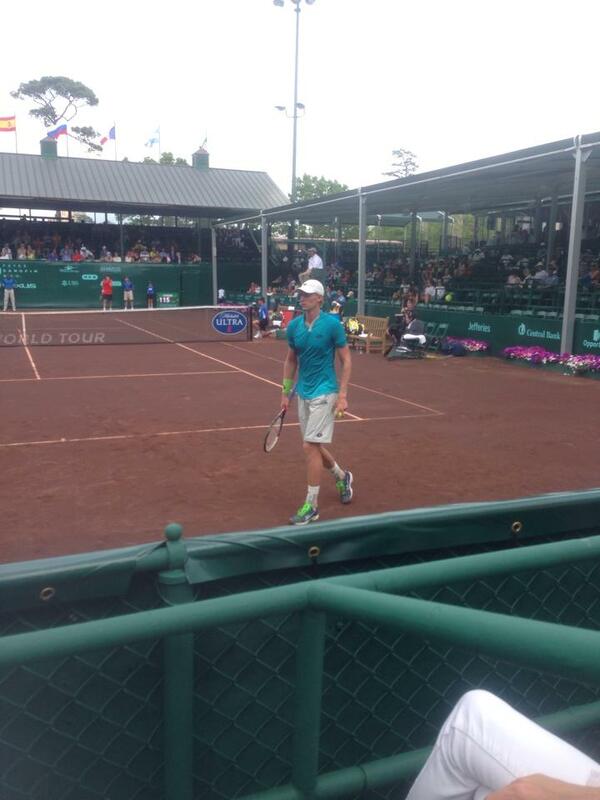 The young American will now go on the quarterfinals where he will face Santiago Giraldo who defeated Janko Tipsarevic. 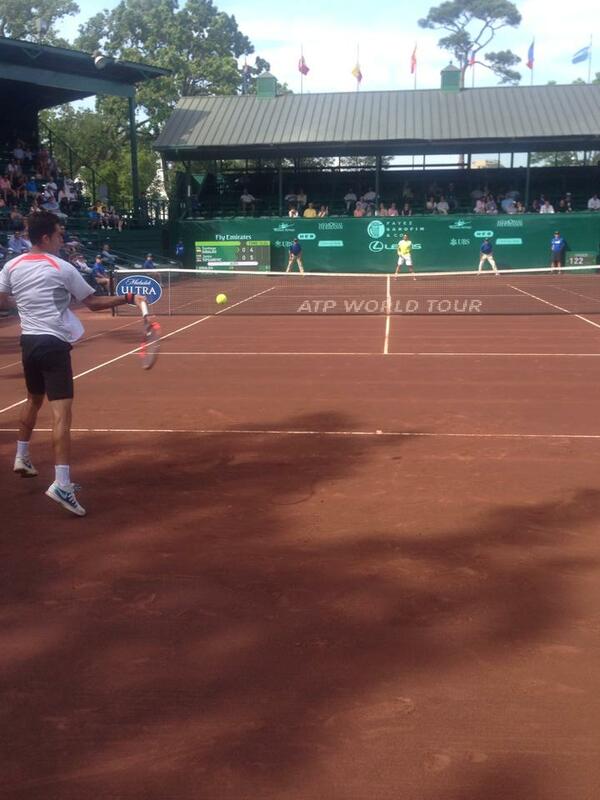 Speaking of Giraldo vs Tipsarevic, that was the next match on center court. This was a highly anticipated match as everyone was very curious to see how Tipsarevic would fare vs. a top 40 player in Giraldo after his long layoff and how well he would respond after his long match on Tuesday. He answered the early questions very positively looking like he hadn’t missed a beat, playing aggressively and hitting the ball heavily. He broke early and took a 4-2 lead in the set. Giraldo would not back down however, He unleashed two consecutive rocket backhands in the next game, using his trademark easy power to set up a couple of break points of his own. 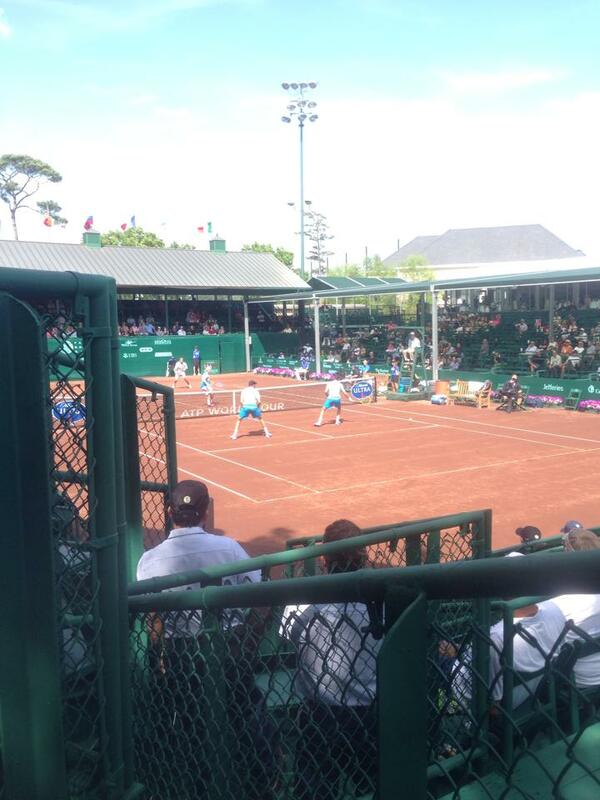 Giraldo converted on the break and evened the set. From this point on in the set it was a very good back and forth battle with both players trading blows until the tiebreak. In the tiebreak a key point was at 2-1 with Giraldo up, a slice took a terrible bounce and Tipsarevic could not hit it back and Giraldo took the 3-1 mini-break lead. From this point on Giraldo played great and did not let Tipsarevic back into the tiebreak and took it 7-2 to the delight of a small section of Colombian tennis fans who screamed out “Santi! !” after every one of his positive points. Early in the 2nd set Giraldo showed visible signs of frustration despite his lead. He sensed an opportunity to put Tipsarevic away early but until that point was not able to completely put the nail in the coffin. Tipsarevic’s level dropped considerably in the 2nd set, whether it was stamina related or not (after the match he would discuss his focus waning in the 2nd set). 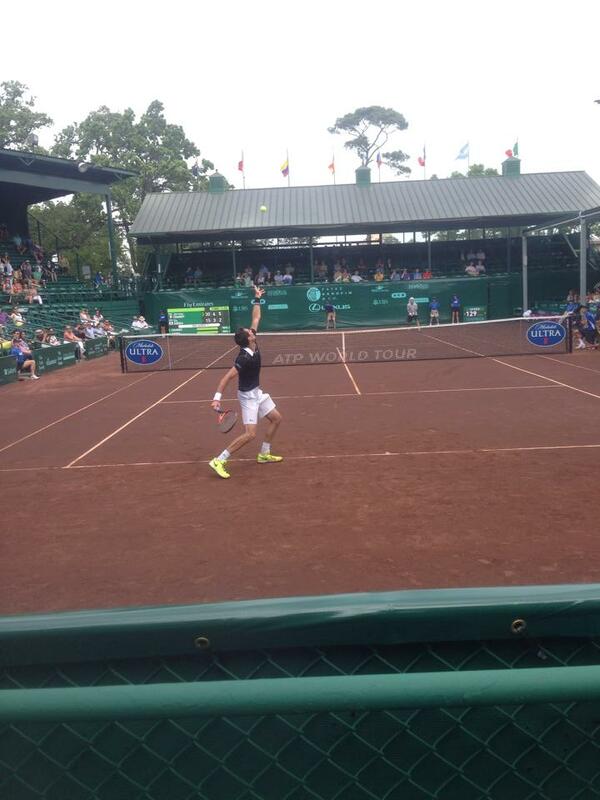 A weak forehand error into the net followed by a double fault gave Giraldo a break, one that he would not relinquish. Giraldo continued to connect sweetly on the backhand side, sending his laser shots to each corner of the court and Tipsarevic was unable to keep up and unable to make an impact of his own on Giraldo. 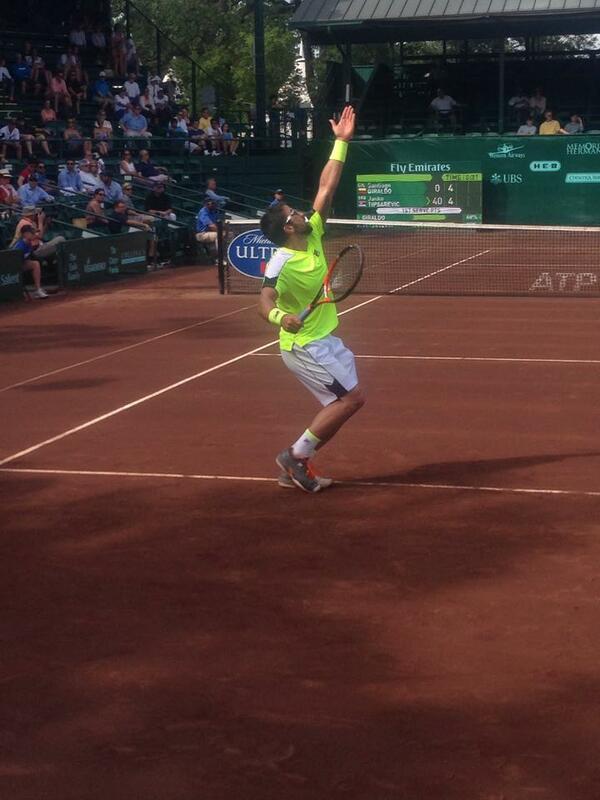 The match came to its conclusion with a 7-6(2) 6-3 win for Santiago Giraldo. After the match I was able to catch up with Janko Tipsarevic. In the first match of the evening session Fernando Verdasco defeated Hyeon Chung 7-6(5) 6-2. This match was my personal favorite of the day. It pitted a 31-year-old veteran vs. an 18 year old up and comer. Chung’s game was impressive in person. His anticipation instincts are very apparent when you first watch him. Several times in the match he read Verdasco’s intentions perfectly and thwarted the Spaniard’s attempts at being wily. In the first set Verdasco appeared to have the game plan to make Chung play as he hit several balls back with little pace simply content to keep the rally going, seemingly testing the 18 year old’s ability. Chung was up for the challenge as he bossed several of the rallies, hitting winners down the line from both wings and keeping Verdasco scrambling. Verdasco did win his fair share of long rallies as well to counter Chung but it was very impressive that Chung was able hold his game and be so evenly matched with the Houston defending champion for so long. Chung also showed signs that he truly believed he could win. However late in the first set Verdasco changed tactics slightly, going for more on his shots and using his big forehand. He also started to bomb serves more often, two serves at 137 mph and one at 138 mph. Verdasco won the long titanic first set battle 7-6(5), one of the most enjoyable sets of tennis I have seen in person. In the 2nd set Verdasco used his new tactics effectively, being more aggressive and keeping Chung more off balance. The Korean’s game dropped slightly as well which allowed Nando to dictate play more and more as the 2nd set went on. One tactic he was able to use effectively was drawing Chung out wide to his backhand side with the crosscourt lefty forehand, Chung had shaky footwork to that side and slipped often, almost guaranteeing the point for Verdasco each time he used that tactic. Verdasco cruised to a 6-2 2nd set which was a mild letdown after the high quality of the first set, but regardless the young Korean can be very proud of his efforts in Houston. 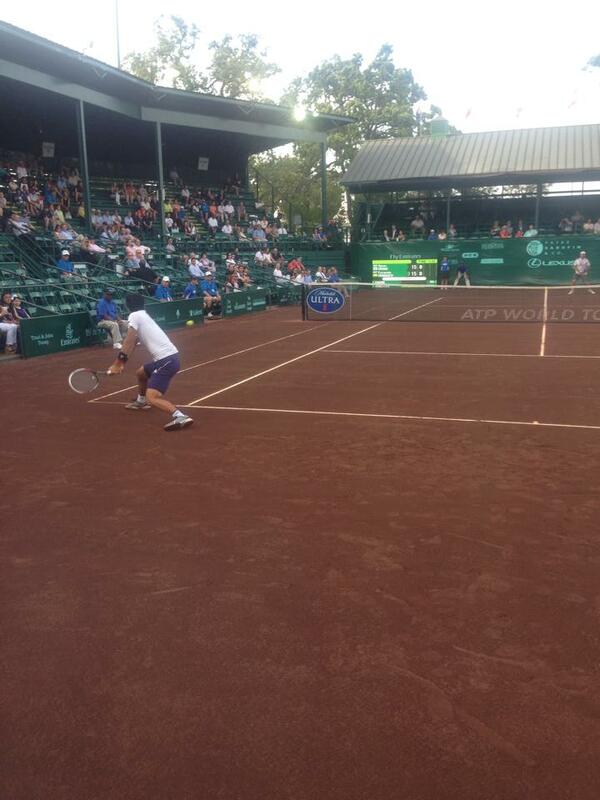 In the nightcap John Isner was stunned by Teymuraz Gabashvilli 6-2 7-6(2) in a result that almost nobody saw coming. This capped what was an amazing day for Gabashvilli as earlier in the day he paired with Berankis in doubles to stun the Bryan brothers. That opens up the draw significantly and it makes the rest of the tournament very very interesting. Huey/Lipsky beat Brunstrom/Young in the other doubles match on the day.